Don Figer established the Center for Detectors as an academic research center within the College of Science in 2010. The center has received more than $11 million in funding. The road trip to Boston took months to plan. By September, the scientists and engineers at RIT’s Center for Detectors were ready. They loaded equipment worth nearly a million dollars into the back of a rented truck and left for Massachusetts General Hospital to “borrow” the particle accelerator at the Francis H. Burr Proton Therapy Center. During the week, the proton beam channels energy from atoms to destroy cancer cells in patients; on the weekends, the accelerator doubles as a radiation source for simulating the effects of the harsh atmosphere in space on astronomical instruments. RIT engineer Brandon Hanold had booked the facility for the weekend of Sept. 7 and 8 to irradiate and test three detectors RIT and Massachusetts Institute of Technology are developing for NASA exoplanet missions, or the hunt for Earth-like planets beyond the Milky Way Galaxy. It’s all about the photon. These elementary particles are units of light emitted as radiation across the electromagnetic spectrum. Photons are like musical notes on a universal scale that begins with radio waves and ends with gamma waves. Imaging detectors collect the notes, or packets of light, and record the radiation in signals that scientists read like sheet music to gain new understanding of astronomical objects. The pressure is on for imaging technologies that can withstand the radiation in space and collect more photons with less interference. Future space missions depend on detectors to sharpen the focus and widen the view and to record the symphony of the early universe without static. This fall, Kolb won a NASA Earth and Space Science Fellowship in support of her doctoral research comparing and contrasting three different single-photon technologies. They promise a level of sensitivity that will pave the way for the next generation of satellites and imaging detectors to peer deeper into space than today’s instruments. Imaging detectors are cameras that read signals in the electromagnetic spectrum. They provide a way to follow photons through the universe, to look down at Earth or deep into our bodies. The light-sensitive material at the heart of the device determines which wavelengths can be read. The silicon detectors the RIT team tested at Massachusetts General capture light in the optical wavelength. Each of the three detectors tested at Massachusetts General took a few hundred steps to make by scientists at MIT’s Lincoln Laboratory, says Don Figer, director of RIT’s Center for Detectors. His lab is one of the few in the world that specializes in testing detectors. Customized equipment and automated software that Figer spent 10 years perfecting capture the state of the intricate hardware. The center conducted testing for the James Webb Space Telescope and is currently collaborating with Raytheon Vision Systems to assess and advance a new “family” of large-format infrared detectors grown on silicon wafer substrates. The Gordon and Betty Moore Foundation funded the collaboration between RIT’s Center for Detectors and MIT’s Lincoln Laboratory to advance optical and infrared detector technology for the future ground-based Thirty Meter Telescope. A grant from NASA’s Exoplanet Mission program leverages the technology and requires radiation testing for possible space applications. Characterizing the parameters of a single detector can take two to three weeks around the clock. 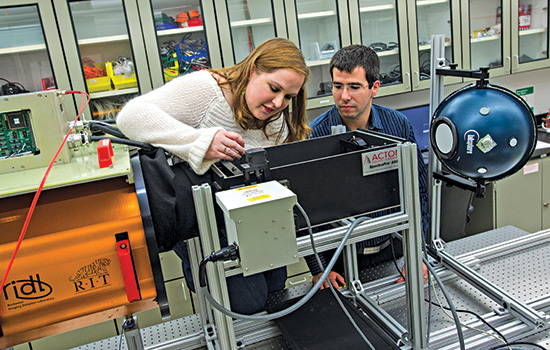 The next step in testing detectors built for space applications requires access to a particle accelerator, such as the one at Massachusetts General. The hallmark of the technology Hanold placed in the path of the hospital’s proton beam is its solution to “read noise,” the interference that muddies the signal as photons hit the sensor. The detector technology, known as Geiger-mode avalanche photodiodes, or GM-APDSs, circumvents read noise through a digital—not analog—design that records each photon-detection cycle with a “0” (no photon) or a “1” (photon). “Eliminating an entire source of noise is a huge deal,” Kolb says. Imaging arrays of Geiger-mode avalanche photodiodes are a single photon detector technology that could revolutionize astronomy. The detector with the ungainly name is comprised of two parts. One component contains the readout electronics. The other part of the detector is the light-sensitive material; in this case, silicon. Before leaving for Boston, Kolb tested, characterized and calibrated the detectors and collected baseline data for post-radiation comparison. RIT engineers Hanold and Joong Lee designed a radiation-testing program compatible with the hospital’s particle accelerator. The team secured the three detectors (in case one failed) in a vacuum-sealed container called a dewar, outfitted with a side window for maximum exposure. Working with scientists at the Burr Proton Therapy Center, they irradiated the sensors in steps simulating up to approximately 100 years in space. “The detectors were incrementally given 10 times the expected dose for a typical mission lifetime of an instrument in space,” Hanold says. Instruments in space cannot be easily repaired. They must be robust enough to function while damaged. Kolb tested the detectors in between radiation doses and monitored the decay during the first 24 hours. She continued testing two weeks later as the radiation reached a settling point. Testing has confirmed the “noise” she expected to see—a higher dark current, or charge created within the devices. Kolb also confirmed an increase in “afterpulsing,” or internal feedback, in the photon detectors. 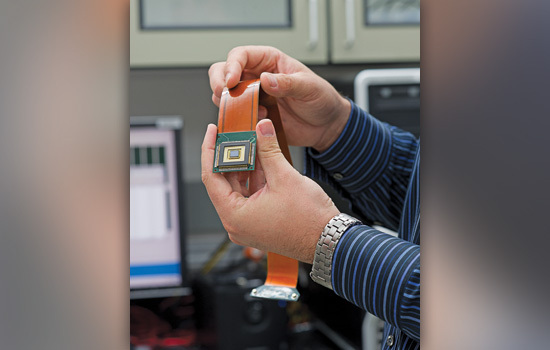 Detector technology advanced for scientific exploration holds societal benefits, from new methods of biomedical imaging to remote sensing applications that monitor the health of the planet or the safety of a nation.